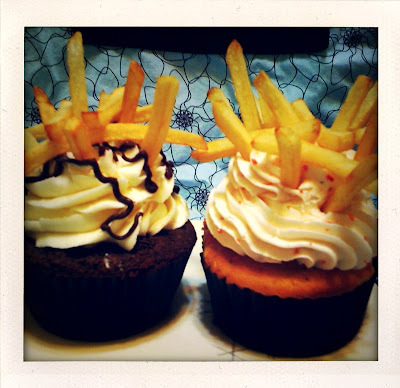 Stoner Food: Sprinkle Some Fries on those Cupcakes. This post is dedicated to the brilliant and hilarious Patton Oswalt. With all of the trendy cupcake shops opening up, I figured I'd skip the baking step (like a typical stoner) and try out a few fancy pants cakes from a local cupcake, uh, boutique?? 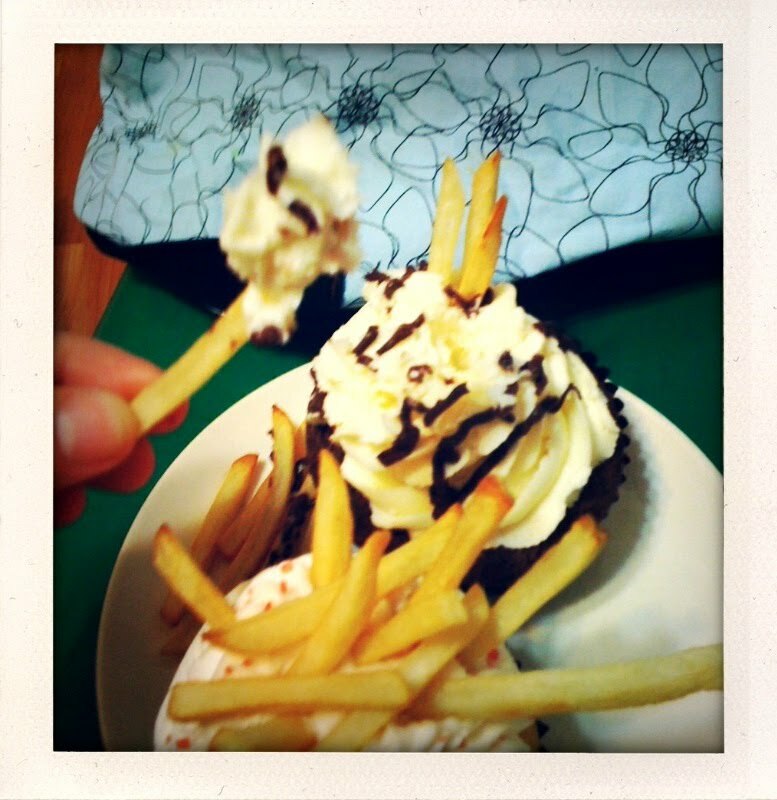 I grabbed a White Chocolate Chocolate and a Strawberry cupcake and toasted up some shoestring fries from my freezer. These cupcakes had TONS of frosting on them (as you can see) and it was delicious cream cheese frosting. However, the icing mixed with the greasy fries made it so that I was unable to take more then a few bites before having my fill. These are definitely for sharing! Make your favorite cupcake recipe or go to a hip cupcake shop and pick up a few 'cakes. Obtain fries from your favorite restaurant/fry vendor, or bake up a few of the frozen variety. Pretend you're doing Japanese flower arranging and place the fries atop the cupcakes. Eat in a straight forward manor or remove the fries and lick off the ridiculous amount of icing (like birthday candles!) Invite a few friends over, fire up the pipe, pop in one Patton's albums and pass the cupcakes to the left.